There has been no let up on the pace of gas discoveries offshore Mozambique since Anadarko announced 168metres of net gas sand in the Windjammer 1 well in February 2010. Barquentine 1 and Lagosta 1 discoveries followed with 127 metrenet gas and168 metrenet gas sands respectively in October and November 2010. These are quite tall hydrocarbon columns, with extensive widthin highly connected fairways. Massive pools of gas indeed. Anadarko’s 36.6% operated Area 1, in water depths of around 1,500metres, includes Mitsui E&P (20%), BPRL Ventures (10%)andVideocon (8.5%), as partners. 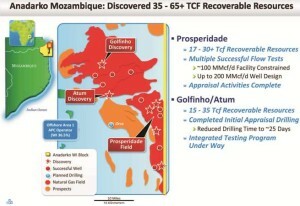 These discoveries have been combined together in what Anadarko has christened “The Prosperidade Complex”. With subsequent appraisal drilling and testing programme, the American independent estimates that this supertank, spanning approximately 260 square kilometers, “holds at least 17 trillion cubic feet (Tcf) of recoverable natural gas, and it could hold as much as 30 Tcf or more”, says Al Walker, Anadarko’s President and Chief Executive. “To put these numbers into context, that’s enough recoverable natural gas to transform Mozambique into the world’s third-largest exporter of LNG (liquefied natural gas) over the coming years”. The Gulf/Atum complex, to the north of Prosperide, is credited with at least 15Tcf of recoverable natural gas, with the assumption that it could hold as much as 35Tcf or more. Initial appraisal drilling has been completed in this complex and integrated appraisal drilling is underway. 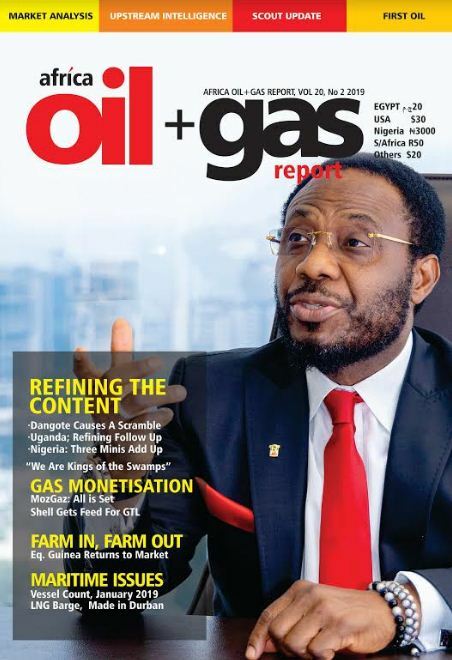 Beyond Prosperidade and Gulf/Atum, the company believes there is the opportunity for even more petroleum resources to be found in the 10, 500 square kilometre Offshore Area 1. “Our partnership has identified more than 20 additional exploration prospects and leads in the offshore block and is continuing an active exploration programme in these areas”. Mamba South was followed, in mid-February 2012, by the Mamba North 1 discovery, located in water depths of 1,690 meters, drilled to a total depth of 5,330 meters and is located about 23 km north of Mamba South 1 discovery. The discovery well encountered a total of 186 meters of gas pay in multiple high-quality Oligocene and Paleocene sands. The site of this rich seam is the Rovuma Basin, deep in the Indian Ocean, the eastern boundary of the African continent. It is in this same basin, in neighbouring Tanzania, that the BG/Ophir Joint Venture(Blocks 1,3, and 4) on the one hand and Statoil(Block 2) on the other, have both been encountering pools after massive pools of gas since 2011. Drilling commenced in Tanzania’s “deepsea” (as the country’s authorities call it) in 2010 with Pweza-1 and since then, none of the operators have gone wrong with a well prognosis. The partners did not sound terribly enthusiastic when they broke the news of the first two gas discoveries, both in Tertiary sequences, in Block 4, around the same time as the initial stories out of offshore Mozambique were making the rounds. This magazine, in particular, got the impression that the Tanzanian finds were somewhat suboptimal. 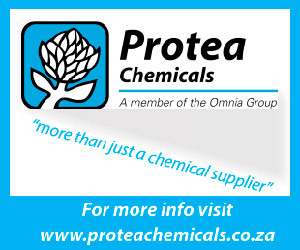 The Joint Venture reported the third discovery, Chaza-1, this time in Block 1, in 2011. The find was approximately 200 kilometres south of the Pweza and Chewa discoveries. The Joint Venture acquired a 3,250 square kilometre 3D seismic survey in Blocks 3 and 4, and a second 3D survey of 1,850 square kilometres in Block 1. At this time BG took over operatorship. 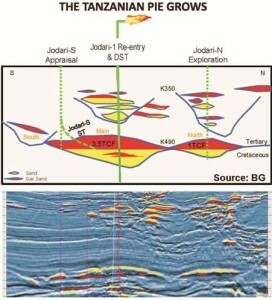 Further success came the following year with the Jodari discovery in Block 1 which, unlike the previous finds, was followed up with appraisal wells. The partners drilled three wells at Jodari South-1, Jodari South ST-1 and Jodari North-1. The JV at this time, began talking about gas volumes and putative field development.“These wells demonstrated consistent, high reservoir quality across the Jodari field and confirmed the mean recoverable estimate of 3.4 trillion cubic feet of gas. The work also confirmed the feasibility of high-angle drilling, thereby reducing developing costs”, Ophir noted in a press release..
3D seismic interpretation had, by now revealed basin floor fans and amalgamated channel sequences of Tertiary age, both being potentially analogous to those seen on the adjacent Mozambique side of the Rovuma Delta. The partners moved to acquire a further 2,500sq km 3D data to image thisMozambique-basin floor type play in Block 1. But while that was going on, they’d gotten ahead to test sequences in the Cretaceous; older sequences of rock than the tertiary age sequences they had encountered in the first four discoveries. The late 2012 discoveries: Mzia 1 and Papa 1, encountered hydrocarbon sands in the Cretaceous. “Mzia-1 opened up an extensive new play fairway within the JV’s offshore acreage in Blocks 1, 3 and 4, to complement the now proven Tertiary fairway. Papa-1, drilled after Mzia 1, represents the first exploration test of Upper Cretaceous Intraslope play outboard of the Rufiji Delta and the first well to be drilled in Block 3. The well was designed to evaluate sandstones of Campanian and Albian age within the structural Papa prospect. “The Papa discovery further de-risks the deeper, Upper Cretaceous Intraslope play in Tanzania. Additional resources have now been discovered in the Cretaceous stratigraphy outboard of both the Rovuma and Rufiji Deltas by the Mzia-1 and Papa-1 wells”. Thus, while the BG-Ophir Joint Venture’s first four discoveries successfully tested targets of Miocene, Oligocene and Paleocene age in the Tertiary Intraslope Play and are currently estimated to have discovered total recoverable resources of ca. 7 TCF (1167 MMBOE), the fifth discovery, Mzia, and the sixth discovery, Papa, both in the new Upper Cretaceous Intraslope Play are expected to add considerable additional recoverable resource to this total. By December 2012, two years after first drilling, BG/Ophir had announced six consecutive discoveries while Statoil/ExxonMobil, had come up with three, all of which make a total of nine, offshore Tanzania. 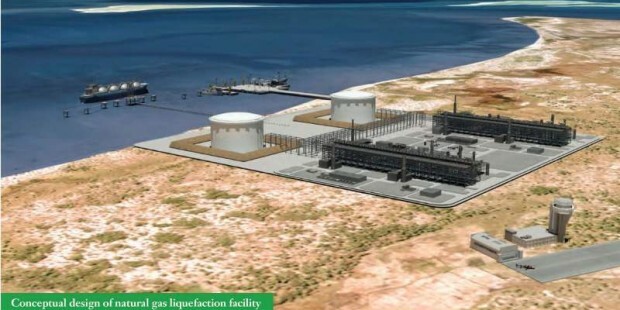 The BG/Ophir JV figures it had discovered 13.5 – 21 TCF as in- place resource of October 2012 which means, in its view, it has proved up minimum commercial resources for two-train LNG development. 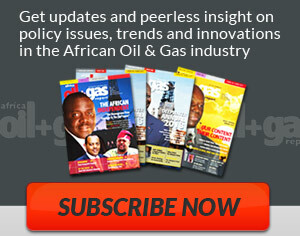 « Is Ghana Stuck At Tano Basin?